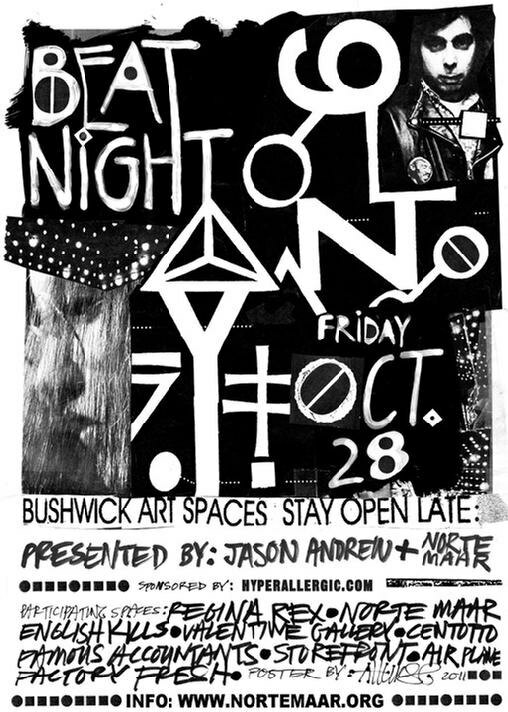 Halloween weekend in Bushwick started on Friday night in a very artsy fashion! Norte Maar presented our most favorite gallery walk, BEAT NITE! It is my pleasure to state that there are so many amazing galleries in Bushwick, that it's getting harder and harder to check them all in one night. This time, 12 galleries and art spaces participated. Some of them were brand new (Airplane), others were still pretty fresh (Small Black Door), while some are good ol' awesome Bushwick spots (Centotto). Take a look at our photo essay, mapping the best moments of the night!